A new film by award-winning director Nanette Burstein, featuring notorious anti-virus developer John McAfee, is set to premiere on Saturday, September 24th on the Showtime US network. The documentary highlights McAfee’s time in Belize leading up to the murder of his neighbour Gregory Faull, and his cunning escape from Belize into Guatemala. 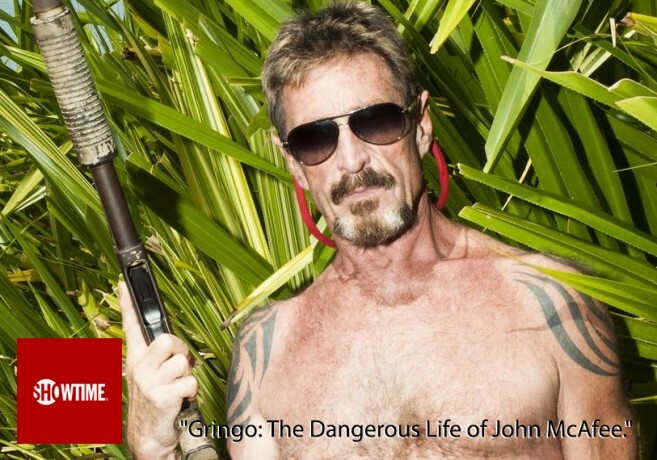 The documentary titled ‘Gringo: The Dangerous life of John McAfee,’ details his unpredictable lifestyle during his time while living in Belize. Burstein, who emails with McAfee, travelled to Belize in order to put the facts together and spoke to the anti-virus pioneer’s chatty and indiscreet colleagues, workers, friends and lovers. The documentary will also feature new information regarding the murder of American Expat Greg Faull, who was assassinated in November of 2012. McAfee refused to be part of the documentary, but continued communicating with Burstein, sometimes obsessively. She described some emails from the anti-virus developer as friendly, nonsensical and others threatening. Burstein stated that McAfee had harassed her through the film’s production and post-production. She indicated that after the documentary premiered at The Toronto International Film Festival on September 11th she received an email with the subject line ‘you are a horrible person.’ The email threatened to dig through Burstein’s past and would make up something if nothing against her could be found. The email did not say it was from McAfee, but it ended informing Burstein that they are watching her. “That weighs on me because I get these emails a lot. They don’t stop, “she said. In McAfee’s first official response towards the documentary, he stated that Showtime paid people to lie on camera. A few days after, he posted a video on his Facebook account in which different persons, including his ex -girlfriends, friends and former employees strongly defend him and accuse Showtime of trying to bribe them. As the network prepares to premiere the film, McAfee recently posted another message on his Facebook page addressing it to Showtime. “This, by the way, is extremely mild compared to the blow I will give Showtime 48 hours before the documentary airs. I have an ironclad case for the $1 billion lawsuit I am filling. My father always said – Never drop the hammer on your opponent until they believe they have won and are completely unaware that the hammer is over their head. The hammer is about to drop,” end of quote. He also claims that the mere reason for the film is due to envy from his enemies. “Over the past couple of years I have rebuilt my reputation. This comeback seems to infuriate those that have worked so hard against me, and has resulted in this latest hateful piece of fiction," said McAfee. The documentary includes several interviews with employees, gangsters and teenage girlfriends of McAfee. Burstein’s investigation gives further credence to outstanding allegations against McAfee, thanks to the many participants in her documentary that were more than willing to speak on camera. The director’s documentarian approach is based on investigative reporting and over the course of an hour and a half, the documentary lays out a searing body of evidence that suggests McAfee paid a hit-man $5,000 to torture and kill his neighbour Gregory Faull. Additionally, it also reveals the chain of events regarding the ill fate of David Middleton. Middleton, who had broken into McAfee’s mainland house, was later abducted, mutilated with knives and tasers, and then dumped on the street to die. Burstein responded to McAfee’s allegations of bribery in a statement, saying, "I am confident that all the interviews I present in 'Gringo' are true. None of my subjects were paid by me or Showtime Documentary Films for their interviews. The people in the film voluntarily came forward to share their stories with me. I truly admire their courage, but understand that under duress, and in light of the vast resources available to John McAfee, these subjects could be pressured to recant their statements." Showtime reiterated by stating, "Showtime Documentary Films does not pay subjects for their interviews. We fully support 'Gringo' filmmaker Nanette Burstein and applaud the bravery of those interviewed in the film." The online promotional clips of the film show those who recognized McAfee as a generous but paranoid person, who was always surrounded with heavily armed bodyguards. He particularly favoured posting pictures with guns and girls in bikinis on the internet. The film received critical acclaim when it premiered at the Toronto Film Festival in Canada, and will air on the island’s Coral Cable Vision on the Showtime channel 22 at 7PM on Saturday, September 24th.